Cardiovascular disease targets all ages, genders and races. It is an equal opportunity offender. 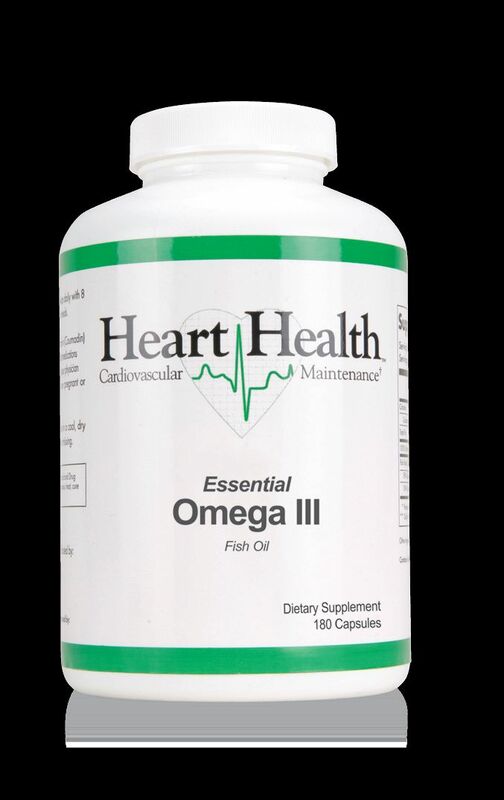 Heart Health™ Essential Omega III Fish Oil provides potent amounts of mercury-free EPA and DHA to support cardiovascular health, maintain healthy blood pressure and may assist in stabilizing cholesterol levels. Fish oils have been clinically demonstrated to provide a host of benefits that successfully promote cardiovascular health. The fish oil used in Essential Omega III is laboratory tested for PCB, dioxin and heavy metals. We only use fish oil that meets or exceeds standards set by Canada (CFIA), European Union (EU) and the United States (CRN). Omega-3 fatty acids have been shown to support a healthy cardiovascular system. In clinical studies a strong correlation exists between fish oil consumption and normal C-reactive protein levels, as well as overall cardiovascular health. Fish oils are important in the maintenance of normal blood flow promoting cardiovascular health.